The dramatic story of sugar cane is a somber reminder of human greed, exploitation and slave labour. The events continue to unfold today, as sugar cane is implicated in contentious issues such as human health, addiction and fair trade. However, behind the drama is a rather intriguing member of the Poaceae (grass) family, Saccharum officinarum L. that is intimately intertwined with our everyday lives. This large perennial tropical grass that looks rather like a bamboo cane can reach a more than respectable height of 3-6 meters (1). Sugar cane is widely cultivated, providing around 70% of the worlds sugar, with the remainder largely being sourced from Sugar beet Beta vulgaris. Click on the photos S. officinarum from the Tropical Greenhouse to discover some of the morphological characters that distinguish this species. This specimen of sugar cane from the Reading tropical Greenhouse is approximately 2.5 to 3 metres tall. Leaf blades are long and rough to the touch (scaberulous). They possess a conspicuous midrib and terminate in a fine tip (acuminate). The leaf margins are also scaberulous. Sections of the culm (stem) that range from 20-45mm in diameter. Sugar cane originated in New Guinea where it has been grown for thousands of years. Since about 1000 BC, the cultivation of sugar cane gradually spread across human migration routes to Southeast Asia and India and east into the Pacific. It is thought to have hybridised with wild sugar cane relatives of India and China to produce the commercial sugar cane we know today (1). Sugar cane was originally grown for the sole purpose of chewing, in southeastern Asia and the Pacific. The rind was removed and the internal tissues sucked or chewed (2). Sugar cane was an ancient delicacy that remained relatively uncontroversial until the method of refining sugar was first discovered in India, most likely during the first millennium BC. The canes were crushed and the resulting the sweet juices were boiled to concentrate and remove impurities eventually forming crystallised sugar (2). With new innovations and increased efficiency to the refinement process it was possible to create the pure white sugar granules that we recognise today. Once the taste of refined sugar had reached the lips of Europeans, their insatiable appetite for this new commodity dramatically increased the demand for establishing sugar cane plantations in overseas territories. Before long, British and French plantations in the West Indies began to dominate the production of sugar cane. However, another commodity was soon introduced that would be inextricably linked with the sugar cane industry for the next 300 years: African slaves (3). A great deal of labour was required to produce large quantities of sugar and the slave trade supplied it. The sweet tooth of Europeans combined with the demand for cheap labour in overseas territories resulted in an altogether more sinister trade: the transatlantic slave trade. A triangular shipping route developed between the British seaports, the West African slave ports and the West Indies’. In British ports, ships were filled with goods and shipped out to West Africa where they were traded for black Africans who had been seized, kidnapped or enslaved. The slaves were often shackled together in unimaginably terrible conditions below deck and transported to the West Indies where those who managed to survive were sold to plantation owners. The ships were reloaded one last time with sugar and rum and sent home to England (3). By the middle of the eighteenth century British ships were carrying about 50 000 slaves a year and British ports on the west coast such as Bristol and Liverpool thrived on the sugar cane industry (3). Ultimately, sugar production provided one of the original means and motivations for European expansion, colonisation and control in the new world, precipitating a course of events that would forever shape the destiny of the Western Hemisphere (1). Surprisingly, even today fair trade and the treatment of workers in deprived countries remains a contentious issue. News articles about the potential adverse affect of pesticides on the health of workers across central America and the treatment of workers in Cambodia are just a few recent examples. Heroin, cocaine, alcohol, tobacco… and sugar. Refined sugar is arguably a drug that has been causing serious harm to peoples health for a long time. Given the havoc it has caused in the past it is no wonder that it has been dubbed ‘white death’ (3). Recent reviews of the scientific evidence have linked sugar intake with obesity and type 2 diabetes. A growing number of health experts are calling for the amount of sugar in our food and drink to be slashed and the World Health Organisation (WHO) is set to recommend a cut in the amount of sugar in our diet early this year. There are even claims that sugar should be regulated in a similar way to tobacco or alcohol in the future. It is likely that these recommendations will be met with some skepticism from the industry, since sugar production is such a lucrative market. However, other than its uses as a sweetener and an edible preservative, there is a whole range of other byproducts of the sugar refining process that are also economically important. After the cane is crushed to remove the juices, the fibrous cane left behind is known as bagasse and it has a range of uses including: a fuel to generate energy for the sugar manufacturing process, serves as a fibre for the production of paper and the pith itself can be used for animal feed. Another important by product of the sugar refining process is molasses, a dark syrup that most would recognise as treacle in Britain. Molasses is also the principle ingredient in distilled rum and used in the production of animal feeds and fertilisers. Pure alcohol (ethanol) can also be fermented from the by products of sugar refinery and fuel produced in this way (bioethanol) is widely used in Brazil and the USA as a motor fuel, as part of a movement to use sustainable alternatives to petrol (1). 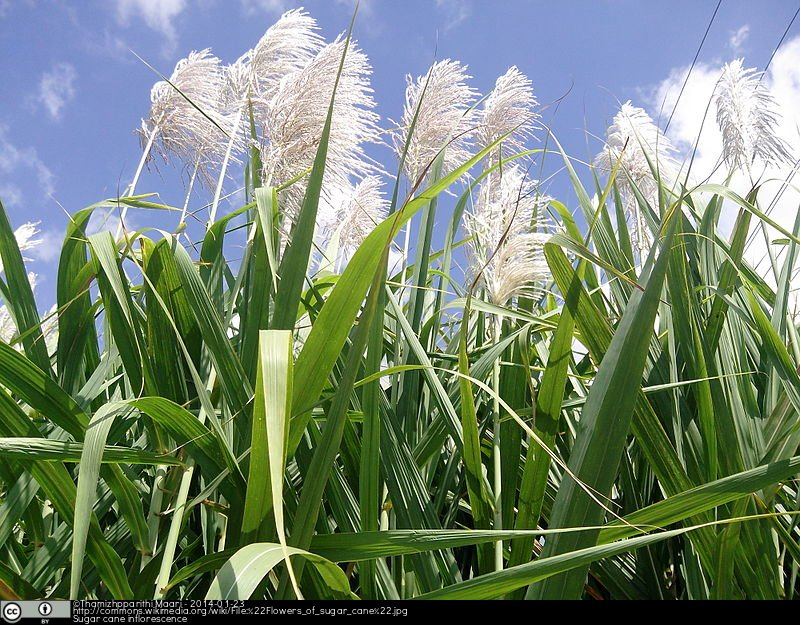 A recent discovery of a bacteria that aids sugar cane production and reduces the need for synthetic fertilisers points the way towards more sustainable cultivation (4)(5). The research team found a new bacterium Burkholderia australis, that promotes plant growth through a process called nitrogen fixation. The taxonomic identity of commercial sugar cane remains part mystery, but there is no doubt that the economics of its production have dominated aspects of western history for over 200 years. While sugar may be bad as a foodstuff it has also provided promise in the production of biofuels to power vehicles for the future. (5) Paungfoo‐Lonhienne, C. et al (2013) A new species of Burkholderia isolated from sugarcane roots promotes plant growth. Microbial biotechnology. This entry was posted in Monocots, Species, Students and tagged Poaceae, Refined sugar, Saccharum officinarum, Slave labour, Sugar cane. Bookmark the permalink.